Of all human relationships, the mother-daughter one is perhaps the most complicated and unique. Mothers tend to view their daughters through a prism of shared history. Yet, as they grow, daughters become their own person with a locked vault of secrets that are completely inaccessible to their mothers, making for a rich spectrum of trauma and emotions for authors to draw from. Here are some of my favorite books that cover the complexity of mother-daughter relationships, from love to loss, anger to blame, jealousy to adoration. One of my favorite books, One True Thing follows Ellen Gulden, who leaves her high-flying career in New York to return home and care for her terminally ill mother, Kate. All her life Ellen has admired her father while feeling a little dismissive of her homemaker mother, so naturally while she’s caring for her mother she’s forced to confront some painful truths. After Kate dies, Ellen is accused of murdering her in a mercy killing. Masterfully and elegantly told with vivid characterizations, this novel is a touching portrayal of the complex undercurrents of the mother-daughter relationship, showing Ellen as she gets to intimately know her mother as more than just a clever homemaker, which completely shifts her view of her father, herself, and her entire life. I was so fascinated by the relationship between Marmee and the four March girls as a child that for a brief spell I began calling my own mother Marmee. In Little Women, Marmee is the moral compass of the family, the emotional center, the model for patience, kindness, and love. Published in two volumes in 1868 and 1869, this enduring story explores the passage from childhood to womanhood of Meg, Jo, Beth, and Amy while beautifully showing how a mother shapes and molds the women they become. This taut, beautifully written thriller explores the mother-daughter relationship between Jenny and her 15-year old daughter, Naomi. When Naomi doesn’t return home after a school play, Jenny’s perfect world comes crashing down and she’s forced to ask herself if she really knew her daughter as well as she thought she did. At its heart, Daughter is a harrowing tale about Jenny’s obsessive search for Naomi, but it also intricately explores Jenny’s soul-searching examination of herself and the choices she made as a mother. One of the most complicated, unconventional, and toxic mother-daughter relationships in literature is Astrid and her mother, Ingrid. Deeply melancholic, bleak, and raw, yet incredibly intelligent, beautiful, and honest, White Oleander is a coming-of-age story that follows Astrid, who’s sent to a series of foster homes when her mother murders her ex-lover in a fit of jealousy. Exploring themes of mothers and daughters, sexuality, and resilience, this story is an intricate exploration of the effect that toxic mothers can have on the people we become. With gorgeous prose and wit, White Oleander is one of the most captivating and heartbreaking stories about motherhood in modern times. Single mother Kate has dedicated her life to Amelia. When she receives a call that Amelia has been suspended for cheating, she leaves work to get her daughter from school, only to arrive to a tragedy: Amelia has fallen from the roof in an apparent suicide. While battling unfathomable grief, Kate must find out not only what really happened to Amelia, but also ask herself the tough questions that all mothers ask: did she ever really have any motherly intuition at all; did she really know her daughter; was she a bad mother? No one draws relationships the way Jodi Picoult does! In Leaving Time, Jenna Metcalfe has been searching for her mother since her mysterious disappearance after a tragic accident when Jenna was young. Jenna doesn’t believe her mother would willingly abandon her, so she hires a psychic and a private investigator to help her piece together what really happened. Poignant, tender, and moving, Leaving Time eloquently explores the depths of emotion a child feels at being abandoned by her mother, as well as explores questions such as why society punishes mothers so much more severely than fathers who do the same. When competitive skier Mindy Wright is in a horrific crash, she is raced into surgery, only for doctors to find out she has a severe form of leukemia and needs a stem cell transplant immediately. But when her parents are tested to see if they’re a match, they learn that Mindy isn’t their biological daughter. Was Mindy switched at the hospital? Was she kidnapped? Does either parent know the truth? All these questions and more bombarded me when I first picked up this fast-paced thriller. Ultimately, this is the powerful story of a mother who will move heaven and earth to protect her daughter, even as the search for the answers to these questions threatens to tear everything she’s built apart. Meg Ashley hates her inattentive, indifferent mother, Frances, and yet she is strangely beholden to her, as Frances is a horror writer whose success has given Meg a very comfortable life. After three years of not speaking to each other, Meg returns home and, desperate to break free of her vapid mother, becomes involved in a plot to write a scandalous memoir. This decision sees her investigating the 40-year old murder behind her mother’s successful book. In the end, she must decide if she really wants to rid herself of her mother for good. Totally different from most other commercial fiction thrillers with a complicated mother-daughter relationship, Dear Daughter has a not-very-likeable protagonist whom you really don’t know you can trust. Rich, spoiled, obnoxious, and angry, Jane Jenkins was convicted of murdering her mother, whom she hated, ten years ago. When she’s released from jail on a technicality, Jane is hell-bent on finding out what really happened that night, because she can’t remember a thing. This is another novel about a woman breaking free of her toxic mother, but it’s intriguing because we can’t tell if Jane is an unreliable narrator or a victim of circumstance. All we know is she really hated her mom. But enough to kill her? Okay, I have to confess, I haven’t seen the show! But I read the book when it first came out and what stuck with me was the relationship between Madeline and her teenage daughter, Abigail. Abigail, Madeline’s daughter from a previous relationship, doesn’t feel that she fits in with her mother’s “new” family, making for a strained, tense relationship that adds a lot of drama to the book. While mostly centering on trauma, domestic violence, and schoolyard bullying, Big Little Lies is also about mothers, daughters, and parenthood,with complex and flawed characters who bond together over their shared troubles. The women we call Mom are the most impactful and important in our lives. Long after we grow up and become mothers ourselves, our mothers still affect who we were, who we are, and who we become. They are a link to our past and our hope that we’ll be better people in the future. 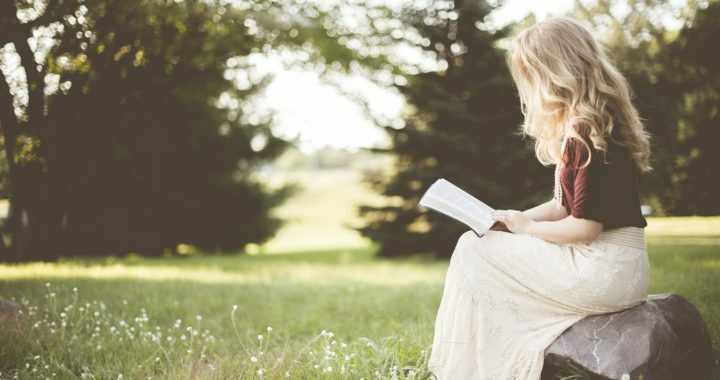 Lifelong, intimate, and developmentally vital, this relationship is often marked with years of baggage, but one of the most wonderful ways to explore these unique relationships is through the pages of a book. Christina McDonald is an author of suspenseful, emotional thrillers. She is also an avid bookworm and a devoted mother and wife. She was born in Seattle, Washington and now lives in London, England with her husband and two sons, where she enjoys reading, writing, hiking and lifting weights at the gym. 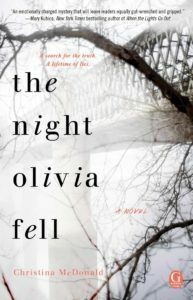 Her debut novel The Night Olivia Fell releases February 5, 2019. Posted in Blog Article and tagged Blog Article, Christina McDonald.